It was our last day in the French countryside. Staying in a 200-year-old farmhouse in a village of 100 people, my husband, Rich, and I had spent the week in our preferred style of travel – visiting small, out of the way places and savoring the local flavor. Our destination for that afternoon was Lucon, chosen for its nice Cathedral and formal gardens. When we arrived, it was clear that we’d stumbled upon an event of some kind. It turned out to be the start of a running race. As runners ourselves, it was with a pang of envy that we watched the racers pass. Being spectators has never been our strong point. Returning our attention to the “sights” of the town, we found a sign listing the afternoon’s events. We had just witnessed the start of the 5500m race, and the 10k was yet to come in an hour. An instantaneous moment of insanity gripped us, as we considered entering the race. But our running gear was an hour’s drive away, too far to make it back in time. Practicality ruled, and we continued our way through the town center. Browsing in shop windows and taking in the town’s architecture consumed 45 minutes, but not our minds…they were still back on that race. So with 15 minutes to the start, we entered in our own race against time – getting outfitted and into that race! Our first destination was a shoe store, where we rushed in and tried to explain in our best high school French (now decades past) that we needed shoes to run in that race! We managed to find two pair that would do, but did not want to commit to buying them unless we could complete the outfit with shorts. Struggling to get our point across, we acquired directions to the sporting goods store, where we found and changed into new running shorts. While I completed the transaction for the shoes, Rich made a dash for the starting line. When I joined him there, he was explaining our plight to the officials – we wanted to race, but alas were not registered. All this with moments to go before the starting time. The response, “C’est ne pas grave!” (that’s not serious) and an invitation to join the race was all it took. Soon we were off with the starting gun! Somehow we managed to understand that the race would be three loops through town. We both ran on adrenaline, not being in our best racing condition, and were cheered on by the officials at the starting line each time we passed. 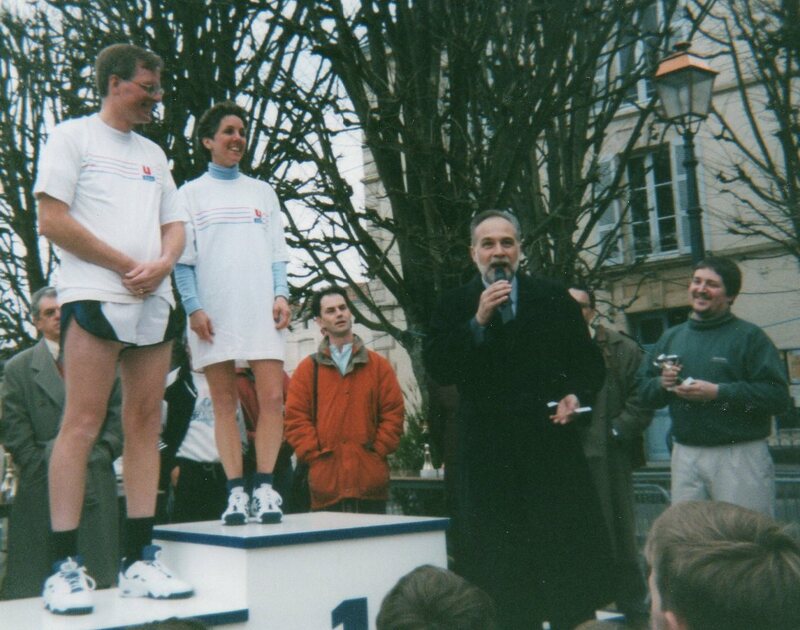 A couple of times we were spotted for running without racing numbers, but a quick shout “Je suis le Americaine!” was all it took – the return look was understanding and forgiveness. We were steered away from the official chutes at the finish, but the words “Etats Unis” ringing out over the loud speakers recognized our finish in a unique way. Our friend from the starting line soon sought us out, along with a woman who turned out to be a local reporter covering the race. Learning the tale of how we entered the race, she entreated us to stay for the awards ceremony. In the meantime, we took a quick loop through town to return to the shops where we had made our purchases. Miming our success, we joyfully thanked the merchants amidst exchanges of congratulations and laughter. We returned to find an Olympic-style podium where local dignitaries presented trophies and large bouquets of flowers to the winners of the various races. The next thing we knew, we heard them announcing our names! The journalist woman ushered us up to the front, where they asked us to take our places on the #1 and #2 stands! Our French served us well enough to understand the Consular General’s description for the audience of how we had come to visit their town, patronized their local shops and joined in the race. He then turned to us and thanked us in his best English. Thinking we were done, we were about to depart when he presented us each with a trophy cup, accompanied by a kiss on each cheek for me, 1-2-3 times, as is the custom in Lucon! We felt quite the celebrities! We never did see that Cathedral, nor the formal gardens. But there is no doubt we took in the local flavor. 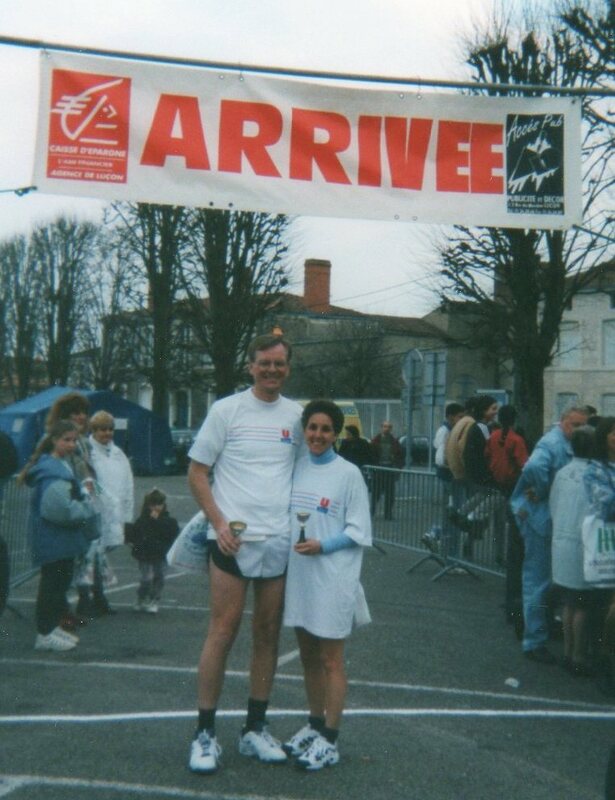 This entry was posted in Keeping Fit, Travel and tagged France, Running, Travel by Molly. Bookmark the permalink. What a fabulous story! -Karen R.